CHICAGO – Chris Rock isn’t a huge writer/director, but when he does make a film, it’s an event to consider. For example, he made black president tale “Head of State” long before then-senator Barack Obama was even considered for the real-life role, and whether behind the stand-up mic or in an interview, he’s a voice to be reckoned with. Even though he’s more in films than behind them, “Top Five” wants to be Rock’s “Stardust Memories,” an open conversation about who he was, who he is, and who he wants to be next. Rock’s comedy is hit-and-miss. Some sequences are excellent, like when Cedric the Entertainer steals the show in an albeit disgusting flashback. Or when he has an epiphany in a jail cell, with a special cameo in place. And there are some good touches too, such as the many faceless cat-calls he gets for his blockbuster character Hammy, or how he talks about “interesting” being a backhanded compliment more than not. The key is often Rock’s willingness to open up. “Top Five” ends with a party, takes place after the center serious movie has been made by Rock’s surrogate, and its title even relates to a recurring bonding discussion topic (top five favorite rappers). However this communal idea, in which he’s inviting audiences to have fun with his image and adventures as Chris Rock, doesn’t make his reevaluating bits any stronger. When Rock is speaking directly to the viewer about his interests as an artist, its often right there on the nose, with the distracting desperation to be taken in a certain way. It works better when it feels more natural, like when Rock is hanging with his close friends & family (played sharply by Leslie Jones, Jay Pharaoh, Tracy Morgan among others). What Rock has made with “Top Five,” more than a welcome party of funny people (with co-producers Kanye West and Jay-Z), is a bottling of modern masculinity in crisis. It’ll be more than just an interesting film to look at in five, ten years considering its unyielding ideas of a man understanding and projecting upon women, along with the film’s presentation of homosexuality. The movie is about baby steps, with some ideas more advanced than others. Set over the course of the day, “Top Five” is a reverse Cinderella tale, in which Rock plays Andre Allen, a writer, director, and star who just released a serious movie (“Uprize,” about a Haitian slave revolution). Though he’s set to marry reality star Erica Long (Gabrielle Union), he becomes the Prince Charming to reporter Chelsea (Rosario Dawson), who interviews him about his current aspirations while he adventures around New York City. Throughout, he recounts different life episodes that have influenced his current sobriety, while charming her with his own transitional self. 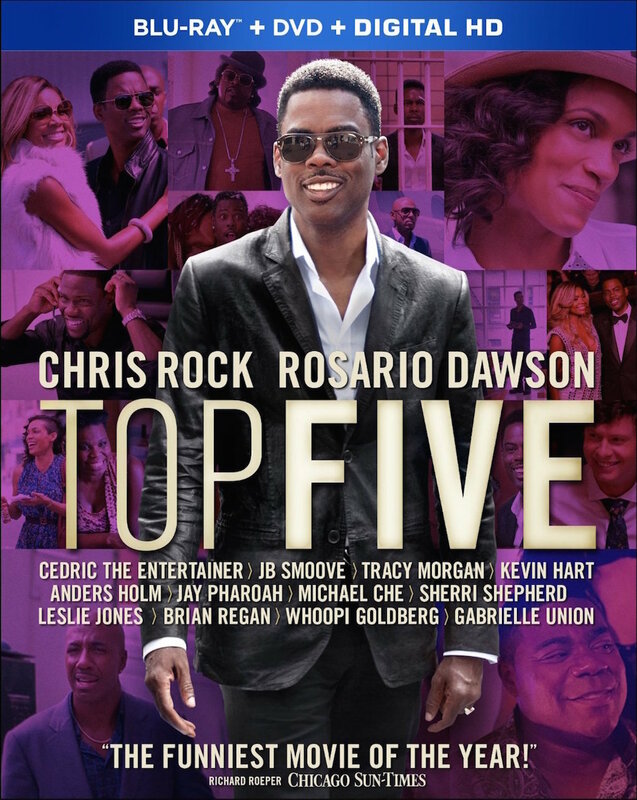 ”Top Five” was released on Blu-ray and DVD on March 17, 2015.